On foreign policy, Trump looks like the caricature Republicans created of Obama. 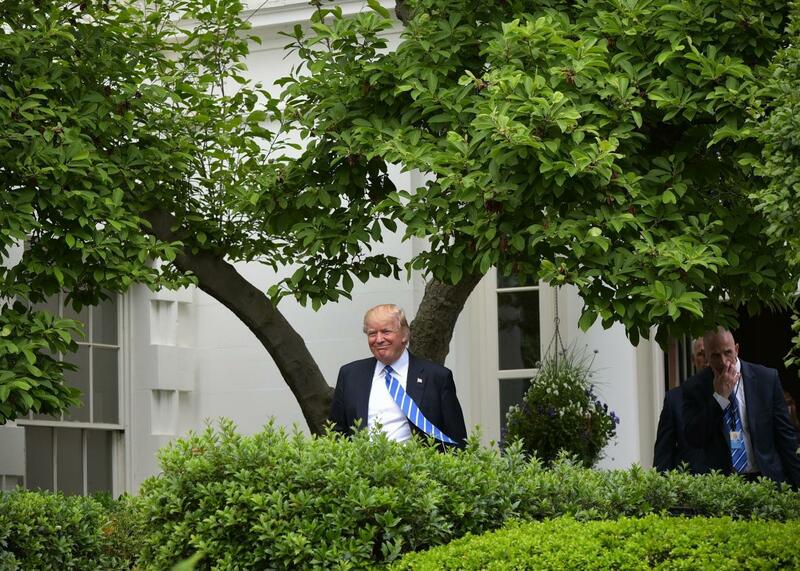 Donald Trump arrives for an event in the Kennedy Garden of the the White House on May 1, 2017 in Washington, DC. If Republicans had a consistent line of criticism against Barack Obama’s foreign policy, it was that he had abdicated America’s traditional leadership role—military, political, and moral—in the world. The argument was that this abdication of power created vacuums that were filled by rivals, and that Obama gave bad guys a pass on their bad behavior. Given that line of argument, consider a few recent foreign-policy moves from the Trump administration. The New York Times reports today that, six weeks ago, during the lead-up to the Mar-a-Lago summit between Trump and Xi Jinping, the Pentagon turned down a request from the Pacific Command to sail a warship near a disputed reef in the South China Sea. The Navy wanted to sail that warship in order to assert U.S. freedom of navigation in marine territory claimed by China. Republicans were extremely critical of the Obama administration when it showed similar reluctance to provoke China, and the Trump administration had at one point hinted that it would be far more aggressive in challenging China’s maritime claims. It’s not clear exactly who turned down the request—it apparently never reached the president’s desk—but the news comes as Trump has been touting his close personal relationship with Xi and has more or less given up any criticism of China, all in the name of securing Chinese help in pressuring North Korea. Also this week, Trump spoke on the phone with Russian President Vladimir Putin and, according to the White House, discussed a plan to set up safe zones in Syria. If this is the same plan that Russia has been circulating ahead of upcoming peace talks, which it appears to be, it involves using Russian, Iranian, and Turkish troops to patrol areas where ceasefire violations have occurred. The plan has been rejected by the U.S.-backed rebels fighting Bashar al-Assad’s government, but if the White House has any qualms about it, they don’t seem to have made them public. Add to that the almost comical disregard for advocacy of human rights and democracy shown by the recent White House invitation for Philippines President Rodrigo Duterte, Trump’s totally unnecessary antagonizing of U.S. ally South Korea, signs from the recent ASEAN summit that countries like Thailand and Malaysia are moving closer to China’ orbit, and new polling showing that the Arab public is increasingly looking to Russia as an ally as U.S. influence wanes, and Trump looks an awful lot like the diffident, unassertive caricature Republicans drew of Obama, just with more bombastic rhetoric and fewer civilian protections in airstrikes. To be fair to Trump, he did argue during his campaign that the U.S. was taking on too much of a global burden and that other countries should share the load, though I don’t think most of his supporters would have interpreted that as a plan to simply follow Russia and China’s lead. If Obama was often accused of accepting America’s reduced global influence, Trump has more or less embraced it as policy.